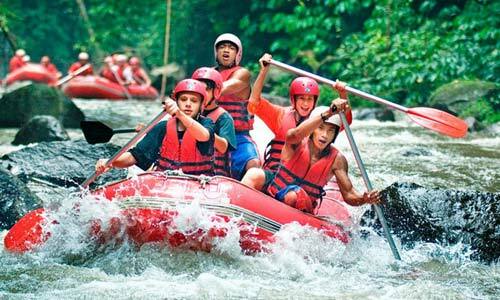 Bali Activities Packages is our products that offer a range of Activities during your holiday in paradise of Bali Island. The Activities we offer are very attractive, full of challenging and fun. Explore the ford of Bali natures walk encircled by the beauty of natural nature with multifarious of flora and fauna, see the friendliness of Balinese resident in the rural area and explore every corner of Bali land and also we will take you to the hidden of Bali paradise Island By joining our service. This tour has provided the interesting Activities such as White water rafting, Day Cruises to lembongan island, Diving, Marine sport, See walker, Fishing, visit a zoo by visiting Bali safari and marine park, Horse riding, Golf with competitive rate. Join and participate from one of the perfect choice adventure gives you the memory which is not fallen into oblivion and later tell to others. WE GUARANTEE, all the adventures that will do all is safe, Best Price, a lot of fun, and ensure your Adventure is memorable one. Please do not hesitate to contact us if there information that we provide is not clear. Bali land activities tours is our products that offer a range of land Activities during your holiday in paradise of Bali Island. The land Activities we offer are very attractive and full of challenging and fun. Explore the ford of Bali natures walk encircled by the beauty of natural nature with multifarious of flora and fauna, see the friendliness of Balinese resident in the rural area.